Mumbai/Pune, Oct 28 (IANS) In a dramatic development, 10 prominent filmmakers on Wednesday returned to the government various awards and honours they had received, protesting impediments to freedom of speech and expression and showing solidarity with the agitating FTII students here. They are Anand Patwardhan, Dipankar Banerjee, Paresh Kamdar, Nishtha Jain, Kirti Nakhwa, Harshavardhan Kulkarni, Hari Nair, Rakesh Sharma, Indraneel Lahiri and Lipika Singh Darai. “As filmmakers, we stand firmly with the students of FTII and are determined to not let them shoulder the entire burden of their protests. They have mounted a historic struggle and we urge others within our fraternity to come forward and carry this protest forward,” the 10 filmmakers said in a memorandum signed by them. The development came hours after three prominent alumni of the Film and Television Institute of India (FTII), Pune, announced that they would return their national awards to protest against “an atmosphere of intolerance” in the country in last few months. They are Vikrant Pawar of Maharashtra, Rakesh Shukla of Uttar Pradesh and Prateek Vats of Goa. In a signed statement released in a press conference in the evening, they urged the central government to “urgently reveal its commitment” to protect the freedom of expression of each citizen. 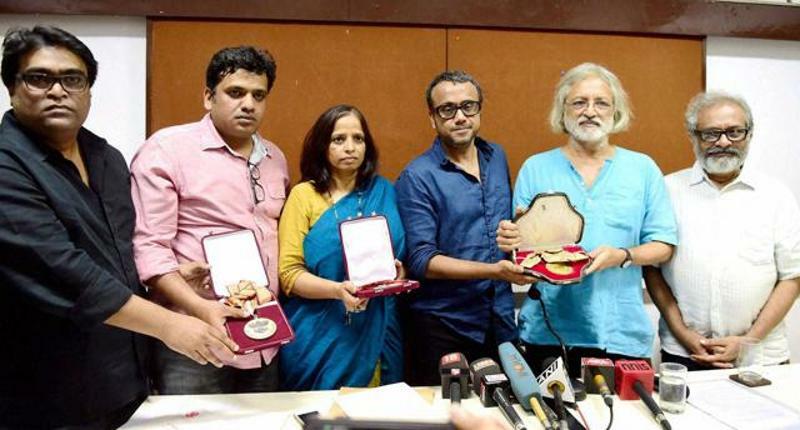 “I never thought I would ever return my award… If the FTII’s ethos are protected and strengthened, not only shall I consider taking back my award, but will hand out 10 other awards with joy,” Banerjee said. Patwardhar said he is “more afraid today than during the Emergency days, because now there are roving gangs looking to do violence against anyone who speaks out”. “We appeal to the people, not the government… We want to be party of the awakening that is happening around the country with scientists, artistes and writers returning their honours,” Patwardhan added. Nishtha Jain, an FTII alumnus, said the national award is still not corrupted and holds up a high standard, which is why it was painful to return it. She added that this was “the beginning of my protest, not the end… We have to think of more clever ways of protests…”. Rakesh Shukla – Donkey Fair (2013).